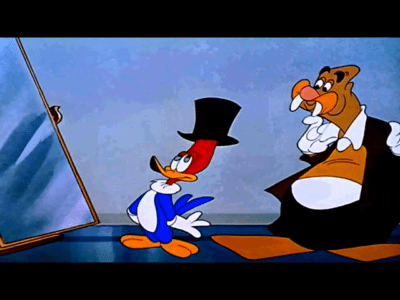 Woody Woodpecker, dreaming of becoming a great screen lover, is awakened by a telegram from the studio telling him to come to work. His screen test starts at 9 a.m., and he must be wearing a top hat. The months have wrecked Woody's hat, so he has to buy a new one. Wally Walrus, proprietor of a hat store, makes a stubborn hat stay on Woody's head by screwing it on. An electric fan, however, soon blows the ornery hat off, and it lands on a frog. In trying to get the hat away from the frog, Woody becomes involved with a bucket and a goose. He fastens a skyrocket onto the goose to get it out of his hat, but he goes up into the sky himself. He arrives at his new job by crashing through the roof, and he's fired immediately. He throws the hat away, but it boomerangs and knocks him out. Woody's dream of fame as a great screen lover ends with a spat with his dream glamour girl.